By John R. Knarr. Presentation to N. Manchester Historical Society, Nov 8, 2010; revised Jan 11, 2010. Our recorded histories have been confusing in understanding the Potawatomi and one of their chiefs named Pierish. 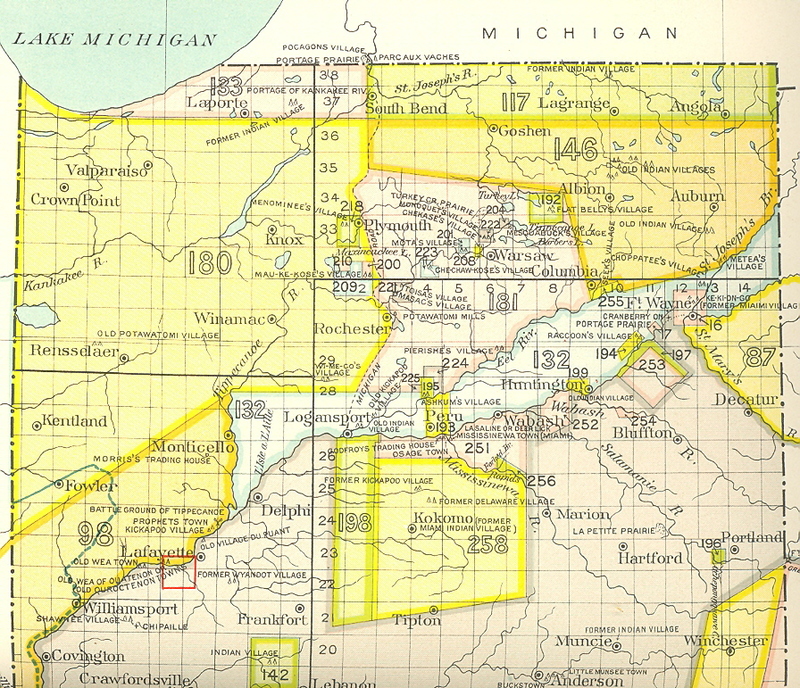 Pierish made an appearance in at least five different county histories which were published: Benton County (IN), Wabash County (IN), Elkhart County (IN), and Branch County (MI), and St. Joseph County (MI). The Potawatomi acknowledge there was but one chief called Pierish. But his name is spelled differently in the county histories and on the various treaties to which Pierish was signatory – Pierre Moran, Peirie Morean, Morran, Morain, Morin, Mo-Rah, Moreau, Pierish, Pieresh, Peeresh, Perig, Perish, Parish, Peirreish, Peannish. The meaning of the Indian name of Pierish is “stutterer” or the sound of a wheel going through mud, as was explained to me by Mary Masters, a descendant of Chief Pierish. According to historical accounts, Pierish was closely allied with Topenebee and son also called Topenebee. Topenebee’s sister was a wife of William Burnett, and Topenebee’s daughter was the wife of Wesau. There were two Potawatomi chiefs named "Wesau"="Wee-son"="Louison", one of them being the son of Pierish. The prominent Potawatomi Chief Wesau who married Topenebee's daughter was the Wesau who had the larger band. (See Ervin Stuntz, The Incredible Wheel of Time, 1983, p. 12.) Pierish's son apparently had the smaller band and was located on the Eel River with between 10 and 13 persons (Tipton Papers, 1828, 1829). Two Weesons signed the treaty of 1826. The one on the Eel River belonged to the Wabash Potawatomi; the other Weeson/Louison belonged to the St. Joseph band. (See Baerreis, The Band Affiliation of Potawatomi Treaty Signatories.) Weeson on the Eel was a half-blooded Potawatomi. He received two sections of land in 1826, subsequently located in Cass County. In 1828 Weeson received one section on the Eel River that included his house and cornfield. His band received five sections in the Treaty of October 27, 1832, with Weeson receiving three sections for himself. In the Tipton Papers (I, 371) we read that Pierish set out for Detroit in 1824, with Topenebee and QuiCaKee to meet with the British. Wampum had been sent, and an invitation to visit “where there was plenty of goods for presents to Indians.” [Tipton, I, 371] In his writings, Winger observes: “For more than forty years Topenebee was chief of the Potawatomi Indians….We first find him as the first of the Potawatomi to sign the Treaty of Greenville in 1795….In the next twenty-five years he signed a number of treaties, always at the head of the list of chiefs. This fact indicates his popularity among all the Potawatomi, for they were well represented at all treaties and their leading chiefs were present….Topenebee was connected by marriage to many Indian and white families of the St. Joseph Valley. His sister, Kaukeama, was the wife of the trader, William Burnett. His daughter, Madeline, was the wife of the trader, Joseph Bertrand. Another daughter was one of the wives of the war chief, Wesau. His niece was the wife of the second chief, Leopold Pokagon.” [Winger , 95-97] Winger claimed that Topenebee signed his last treaty at Chicago in 1821 [p. 96]. Yet “Topenibe” was signatory at the very top of the list of Potawatomi Chiefs in the 1826 treaty. According to Isaac McCoy, Topenebee died on July 29, 1826 as a consequence of falling from his horse (History of Baptist Missions, p. 286). The Potawatomi family connections were important. Chief Leopold Pokagon was the husband of Elizabeth Topenebee (niece of Chief Topenebee) and the father of Chief Simon Pokagon. Chief Abram B. Burnett's grandfather was Chief Chebass, the brother of Chief Topenebee. According to Isaac McCoy, Chebass was one of the principal chiefs on the St. Joseph River, and he lived in the same village as Topenebee (McCoy, History of Baptist Missions, pp. 110, 179, 224). Chebass was the biological uncle to Elizabeth Topenebee. Nancy Davis-Burnett, was the daughter of Kaukeama and William Burnett. Nancy was the sister of Abraham Burnett, the adopted guardian of Chief Abram B. Burnett [Nan-Wesh-Ma]. William Burnett was a fur trader who had married Kaukeama, a Potawatomi woman and sister to Chief Topenebee. Their son Abraham Burnett was half-Potawatomi. Abraham Burnett had fought on the side of the Prophet at the Battle of Tippecanoe, as had Pierish who had Kickapoo ancestry. In 1811 Abraham Burnett led a band of Potawatomi and Kickapoo warriors in an attempted ambush of William Harrison's troops. Pierish's wife was a daughter of Abraham Burnett. Chief Topenebee was a son of Chief Nanaquiba, a brother to Chief Chebass, and the brother-in-law to William Burnett. Abram B. Burnett, the grandson of Chief Chebass, was a well-known "heavy-weight" -- at the time of his death he weighed 496 pounds. To the Potawatomi, his obesity was a sign of influence and wealth. Abram B. attended the Choctaw Academy at Blue Springs Farm in Kentucky, the first Indian school for sons of Indian chiefs; this academy was designed to educate the future tribal leaders. There Choctaws, Potawatomi, Creeks and other Native American youth attended. Earlier, Abram B. as a young boy had attended Isaac McCoy's Baptist Missionary School. The 1826 Treaty with the Potawatomi made specific reference to “Pierish’s village” on the Eel River. On old maps this location is represented as in the vicinity of where Manchester College athletic fields are located. [Click here for a map showing the village location on the Eel River] The Potawatomi bands liked to hunt game during the winter on both sides of the Eel River. The Miami Indians were present to the south, clustering along the Wabash River, from the Forks of the Wabash (Huntington) to Peru and beyond to Logansport. The flat terrain between the Eel and the Wabash River was the buffer between the Miami and the Potawatomi tribes. The Potawatomi had held sway north of the Eel River and north of the Wabash River during 1800-1826. This region represented the outskirts of the Potawatomi tribal domain at that time. Besides Pierish's village, a number of other Potawatomi villages were located on either the Eel or the Tippecanoe Rivers. There is ample evidence that these bands liked to move back and forth between these two northern Indiana rivers. Chief Ask-kum's residence for 1827 and 1828 was listed in the Tipton Papers as on the Tippecanoe. In 1829 his village was located on the Eel River, with a population of 65 persons. The location of Sko-mans (Shkaw-koo-mawn) was given (1827 and 1828) as the Eel River and Chippewa Town that was located on the Tippecanoe River. Tipton records that Kee-wan-e (Kee-wau-nay) in August of 1828 as having a home on the Eel River with a group of 30 persons. The following month, in September, he is on the Tippecanoe River with 29 persons. Washeone's location in 1828 was on the Wabash River. The 1829 payroll gives his (Wah-she-o-na) location on the Eel River with 26 persons. Article II of the October 27, 1832 treaty reserved for the band of Ash-kum and Wee-si-o-nas sixteen sections to include their village. This land was located on north side of the Eel River (Royce 224; 7 Stat. 399). The location for Cho-kaw-kose (Che-chaw-kose) in the 1828 Tipton payroll was on the Eel River with 35 persons. His 1829 location was listed as on the Tippecanoe with 46 persons. The Treaty of October 27, 1832 reserved in Article 11 for the Cho-Chaw-Kose band ten sections to include his village (Royce 208 Plate CXXVII, 7 Stat. 399). Bee-yaw-yo (Bee-zaw-yo() was also residing on the Eel River (Tipton 1829 payroll). In 1823 Shaupatee (Shop-po-tee) had signed the same document as had Toisoe, Metea, Mo-sack, Noqua-shat, Manke-see, Pa-mah-pah-to, suggesting close proximity of their villages on the upper Eel River. In the Tipton Papers, Shaupatee was identified in 1828 as being on the Eel River. In 1829 he was on the Eel River with 40 persons at the "old village of Pierrish". In 1831 Shop-po-tee was with 34 persons. Wymego's village was at Metomonoung, located on the north bank of Indian Creek, a tributary of the Tippecanoe River, and located midway between the main Tippecanoe and Eel Rivers (Royce plates CXXVI, CXXVII). The residence of O-ka-mawns ("The Blind Chief" was given on the 1829 Potawatomi payroll as "Mta-mo-naung." Como-o-zoo (Co-mo-sho) in 1828 and 1829 was located on the Tippecanoe. In the 1828 payroll Co-mo-sho was at the "Upper Mtomonaung." One of Pierish's sons was also located in the Tipton Papers (II, 235) as being located with eight persons at Mtomonaung. A note appended to the Treaty of September 20, 1828 referred to the reservation of Pe. Langlois" wife on the north side of the Eel River between Peerish's village and Louison's reservation (7 Stat. 320). Article III of the February 11, 1828 treaty with the Miami: "At the request of the Indians, and in part consideration for the cession aforesaid, the United States agree to pay to Peter Lanlois, one thousand dollars in silver, and three thousand dollars in goods next summer, for provisions and goods heretofore delivered to said party." The treaties in 1826, 1827, 1828 and 1832, among others, called for the Potawatomi and Miami to cede to the United States their right to land on which they had lived and hunted. Peirish…15; Peirish Wife…6; Saw,crant (son of Pierish)…30; Wee son …40; Geo. Cicott (younger brother to Zachariah)…65; To-pa-na-bee …16. According to Pierish’s descendants, the log cabin referenced by Winger was not likely constructed by Pierish. Pierish preferred, they say, to construct platforms in large trees and to sleep on such platforms. It is said that Pierish died when he fell from such a platform in Parish Grove. Such a cabin might have been constructed by Cicott as a trading post, since Cicott had trading posts up and down rivers. According to the field notes by the governmental surveyor in March and April of 1834 [National Archives, College Park, MD], Helvey’s “House” or “Cabin” was mentioned three different times. In one notation by the surveyor, it was described as “a Cabin built by H.” [April 27, 1834] Richard Helvey was the first white settler on the north side of the Eel River in the North Manchester area. He had apparently arrived during 1833-1834 after the Potawatomi cession of land in 1832. It is also of some interest to find out that the surveyor in 1834 failed to note any signs of an Indian village near Helvey’s cabin on the same side of the Eel River. Rather, the surveyor observed evidence of a former “Indian Village of considerable extent” on the other side of the river, to the southwest of where the Chester Township Fire Station is today located. As noted by the surveyor on May 27, 1828: “Timber remaining is mostly Oak. There is perhaps 60 or 70 Acres entirely clear & seems to have been cultivated. A small distance S.W. from the Corner.” My own experience in finding various artifacts, stone implements and relics in the fields directly to the north of that particular location would lend support to that particular observation; those fields were apparently popular hunting grounds along the Eel. The following document is the Deed Record for the sale of Pierish’s section of land at the mouth of the Elkhart River to Dr. Havilah Beardsley. Dr. Beardsley once made an artificial nose for Chief Pierish. Pierish had had his nose bitten off many years before (when he was about nineteen years of age) by an Indian, possibly a Cheyenne. (According to tribal records, there was one other “no nose” Potawatomi chief.) Pierish was reportedly successful in tracking down the culprit and returning with a scalp. Pierish lived for many years with his facial disfiguration until Beardsley fashioned a prosthetic replacement. By reading closely the following Deed Document, one finds Pierish’s name spelled in different ways [as we find it to be true also in the John Tipton Papers]. Also note that the document was signed in the presence of F.R. Kintner. Frederick Kintner was a respected and successful Indian trader who apparently knew Pierish very well. Kintner was based initially in the Wabash area with a trading post at Richvalley. He and his brother James Kintner eventually moved to Logansport, where the Indian Agency had been relocated from Fort Wayne. Both Kintner brothers had served at the Paradise Springs Treaty grounds in 1826. (My mother’s maiden name was Kintner; James and Frederick were my second cousins, five times removed.) It is therefore significant that Kintner’s signature as witness was evidence of a strong Wabash country connection with the Pierish band of Potawatomi. Regrettably, Winger does not include Frederick and James Kintner in his chapter on Indian traders. On the old maps of Wabash County, there is a stream called Kintner Creek, named in their honor. It is a small tributary to the Wabash River at Richvalley. It flows along the north side of Northfield High School and Sharp Creek Elementary. Kintner Creek more recently became known as Sharp Creek, thereby losing its historic connection. According to the History of Cass County (Helm, 1886), the Kintners, along with Harvey Heath, formerly of Corydon, Indiana, located in Logansport circa 1830 and started the first harness and saddlery business. Their first location was in a log building on the northwest corner of First and Canal streets and later at what is now known as 210 Market Street. Frederick Kintner died circa 1835-1836. J.H. Kintner filled the office of sheriff (1830-1834) and other public positions including Mayor of Logansport (1845-1846; 1849) and Councilman (1863-1864). In 1868 James Kintner was an Indian agent in the West; he died in Indianapolis in 1885. 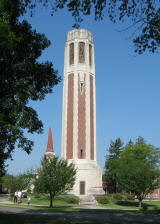 Prior to 1828 the Indian Agency was located in Fort Wayne. It made sense then that Pierish’s seasonal village on the Eel River during the period ca 1816-1826 was strategically located in a forward position on the perimeter of the Potawatomi territorial sphere of influence, as near to Fort Wayne as possible without encroaching upon Miami interests. The tribal leaders had to travel to the Indian Agency to receive their annual annuities. The September 1827 Treaty removed the Indians from the Chicago Road and ceded all tracts reserved by the Treaty of Chicago except that at Nottawa-seepe in St. Joseph County, Michigan; a large addition was received by the Nottawa Indians for a total size of 99 sections. At the top of the signatory list of Potawatomi Chiefs was Penaishees (Little Bird); after Topenebee died, Little Bird was recognized as the head chief of the Potawatomi. (See History of Branch County, MI.) PIERISH MORAN (Morau) was the second signer of the 1827 Treaty. Pierish had become the principal leader of the Nottawa portion of the Potawatomi. The earliest reference I could find of Chief Pierish in this region of Michigan was in the LETTER BOOK OF THE INDIAN AGENCY AT FORT WAYNE 1809-1815. On page 251 of the Letter Book, reference was made of "Magwagos village" or "the party of Moran on the head waters of Grand River." Pierish's oldest son Sau-au-quett (Sau-quett) was to become the head of the Potawatomi at Coldwater reservation. He was described in the History of Branch County as a "half-breed" and tall, being 6'3" in height. I J.B. Duret Clerk of the county aforesaid, do hereby certify that Lambert Boncau Esquire whose hand and seal is affixed to the foregoing certificate of acknowledgement is and was at the time of signing and sealing the same a Justice of the peace of said County, duely commissioned and qualified and that full faith and credit is due to all his official acts as such. During the 1820s and 1830s Pierish and some members of his family can be found in lower Michigan, associating with, and leading the Nottawa band. Pierish’s oldest son Sauaquat was murdered in Coldwater MI by a Potawatomi rival. There were Potawatomi who strongly opposed and resented Pierish’s support for the various land cession treaties and the fact that he and family members benefited financially from the sale of reservation lands. The Nottawa band usually moved at least twice a year. Beans and corn were raised during the summer months and then members of the band would remove to some hunting ground in the winter where wild game and beaver were more plentiful. [See History of Branch Co., MI; History of St. Joseph Co., MI] Pierish’s village as well as other locales along the Eel River provided attractive destinations for the roving Potawatomi bands. The 1832 treaty provided a reservation at Notta-we-sipa for the Nottawa band, but this tract too was subsequently ceded to the United States by treaty later in the 1830s. Pierish eventually returned to the region where he was born, and then moved north to Benton County where he died circa 1835-1840. The statements in the above paragraph are not supported by the historical evidence. As I have attempted to show, Pierish’s signature on the 1826 treaty is not “the only tangible evidence of his existence.” It is unfathomable why Winger did not include in his Bibliography on page 159 of his book the three volumes of the John Tipton Papers in which there are copious references to Pierish signing treaties and being the recipient of annuities, rations and provisions. Winger also does nothing with Pierish’s Elkhart land transaction with Beardsley; nor does he reference the Benton County materials or the several treaties to which Pierish affixed his mark. Our written history reflects the development of our knowledge and the extent of our research. Read, then, the following article with some caution in light of the aforementioned findings and thoughts, and with an appreciation of the various challenges to a fuller understanding of our historical backdrop and surroundings. Also, the coverage of the Potawatomi by our several older county histories did reflect the state of our knowledge and sometimes the prejudices and/or agendas of the authors. President Otho Winger did considerable research about the early Indian settlements near North Manchester. One was the settlement just north of the present College athletic fields believed to be that of the Pottawatomi Chief Pierish. He had a double log house with a fireplace and when he died he was buried just outside the house, somewhat under the base of the fireplace. This site was a well chosen one on a bit of a bluff where the river made a bend and where formerly two good springs flowed from the base of the bluff. When, in 1834 Richard Helvey made the first permanent settlement near North Manchester, this white settler chose the site of the old Indian village. Later the land was owned by the Cook family. Just north beyond the Cook homestead was the old home of Judge Comstock, one of the prominent pioneers of that early time and the father of Liberty Mills. Across the campus grounds, Indian trails led down to the Kenapocomoco. No doubt Indian braves of long ago held their games and performed athletic feats near the Chief's village.. And somewhere close to the present day road to Liberty Mills it is believed the first corn grown in this country thrived under the care of the Pottawatomi women.